Refined and ready no matter where your day happens to take you. This compact Suvelle Lightweight Classic Travel Everyday Crossbody Bag is your go-to bag for work to weekend and anything in between. Keep up with your daily activities while looking fabulous and remaining hands free with this convenient comfortable adjustable cross body strap that adds on the go ease. The Suvelle Lightweight Classic Travel Everyday Crossbody Bag is styled in practical, durable water resistant nylon material, with so many organizational features rolled into one great looking multi pocket handbag by Suvelle, it includes 2 front exterior pockets a zip and a slip pocket, 1 back exterior zip pocket, exterior includes a side loop key holder, interior is fully lined in easy to see silver lining, features back wall zippered pocket, 5 card slots, 2 pen loops, 1 multi purpose open pocket and offers plenty of storage to fit an ipad, tablet and your daily essentials.The Suvelle lightweight classic travel everyday crossbody bag multi pocket shoulder handbag comes in a variety of colors. 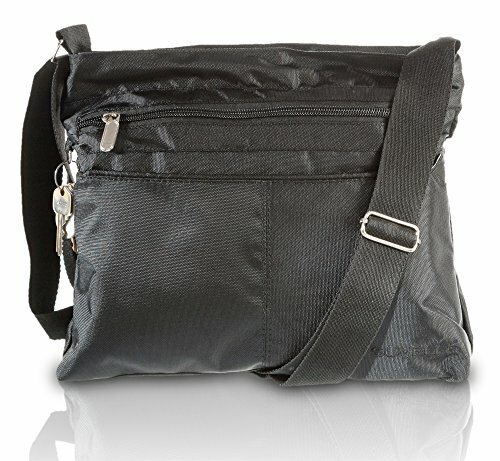 EVERY DAY AND TRAVEL CROSSBODY BAG: The Suvelle sleek classic crossbody bag is stylish, with a variety of storage options & organization features, ideal for travel, errands, shopping, every day use, weekends and diaper bag for parents on the go. This is the bag you'll want by your side wherever you go!! !